Funny how the "drone" puts up a roost at 0:16. Yeah, saw the same. Wondering if it has spikes. Sorry guys it was a bad joke, when I showed the video to my friends they also knew easily that it wasn’t a drone. I knew that almost nobody will believe of the drone . I put the video like that on internet because I found it funny the way that the gimbal has moved from top to bottom and can create good transitions. It gave me the idea to put the drone sound when I saw the footages. Dickhead! I thought it might actually be time to purchase a drone. @dixieponch - wait, so there were two people going that fast through the snow?? Yeah I’m mostly bummed about this because I want a drone that can do this. :/ I guess we’ll keep waiting. Thanks for getting my hopes up. Still, fun vid. It was a drone, a drone with 29 inch wheels and dual suspension and his mate 'controlling' it. So Pinkbike is now using Clickbait titles ??? Why are we playing this game? Anyone who thought that was a drone probably also believes vaccines cause autism. @bigtim: that is not fair to say. It is proved scientifically that vaccines work. It is a matter of education and not believing. this edit is a different thing. education in "drone management" is not so wide spread. personally, I do not use drones and I have zero experience using/seeing/flying this thing. it means that first moment I had to contemplate what is wrong with the video, if it possible to build this kind of machine...you see? you can collect and justify all your physics/kinetics knowledge and end up confused. lack of information, lack of experience, lack of education. and it is not fair to make "fun" of "anyone who thougt"...because it can happen to you in different area. Only blind and stupid don't see it's not a drone. @ka81: so why don't you write directly, that I am stupid and blind. should I thank you as well for my evaluation? I admit I thought it might be some kind of drone. I simply didn't know. I had doubts, but I did not know. That is why I brought my doubts into the comments bellow and tried to justify my doubts. I envy every farsighted and infallible reader of this web, who was not blind and stupid and saw immediately that it was not a drone. hope you are farsighted and infallible in all the things life throws at you. no doubts! been everywhere, seen everything! Yea, the new DARPA drone, it shoots lasers out of it's eyes, and can find Freeriders even when they are completely hidden in local pub's masquerading as drunk's! These drones are insidious and must be banned from the local trails before AI controlled swarms descend on local micro brewery's and wipe out the entire population of fast riders! This is what winter DH races should be like! Loved it. 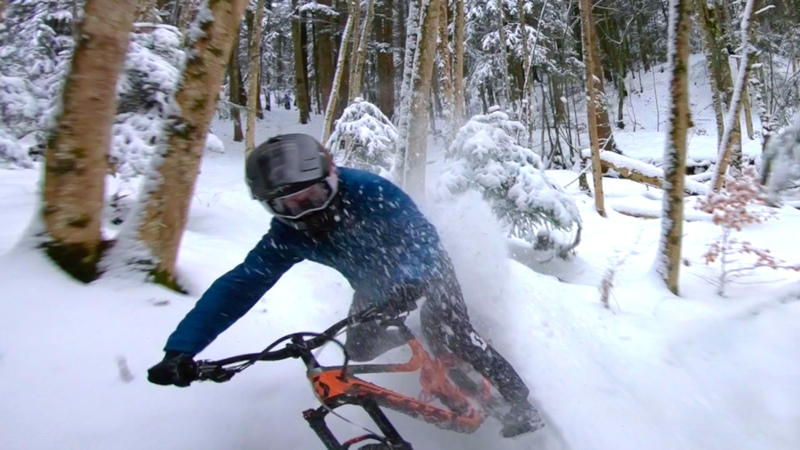 Pinning it on a snowy trail gets the adrenaline flowing Like a river. How did this make the front page? @bigtim: riding on the snow at this speed was not mental ?? @mikev12: Don't get me wrong, I'm sure it was good fun riding to do, but it certainly wasn't 'mental'. The stuff that the Fest boys and girls are doing is in the 'mental' category, but this was just a couple guys riding in the woods (a lot of it not even on snow, more in between snow) and then trying to fake it by saying it was shot by drone when they have clearly just put a crappy drone sound track over footage shot from a camera attached to another rider. So no, not 'mental'. @bigtim: Vinny T is a fest rider though... in this case he should have just called it a rear mounted cam rather than a drone. Done himself a disservice here. @samjobson: I'm not questioning his general ability. If he rode and hopped off a kerb would that be 'mental' just because he is able to hit the massive fest jumps? Nice way to utilise drones! It would be more entertaining watching people try to ride uphill in the snow.